Here are some suggestions for future foobar updates. And of course, this is a no rush thread so I’m not expecting these improvements to come with the first next update. 1. Option to minimize ReplayGain / Converter window during scanning / updating / converting files. If big amount of files are selected and sent to replay gain scan or to converter process it may take a while to finish. Option to minimize that window while not interrupting replay gain scan / converter process would be nice. 2. 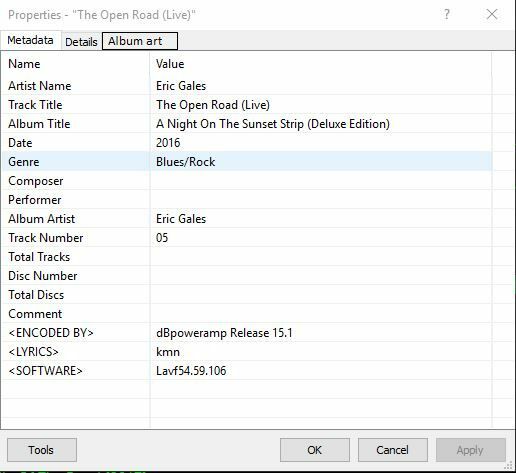 Option to display album art (cover art) whether it is embedded or not (but maybe embedded would make more sense) in properties window of file. 3. Option to configure which metadata fields are displayed in selection properties component. This is possible in Columns UI, so I guess it would be nice to have that option available in Default UI too. add function %country% and function %flag% to display country's and flags at the playlist for a link source. I created the picture in editor (see attached pic.) for example. Probably display the flag of the country will not work, but the name of the country is possible (I think so). I would like to be able to organize tracks in the playlist in folders. For example, one folder could contain say 20 songs, another contain 30, etc., and each folder could be opened and played as needed. I would like an admonitory dialog in Library > "send to playlist", like "This would eliminate all the content in your playlist. Are you sure? ", because after many years using foobar I still clic very often in send to playlist when I want add to playlist. Thanks to @kode54 for DUI version! Display embedded pictures of any "type", not just front, back, artist and disc, especially if there is only one picture attached. "Band logotype" would be particularly useful for me, as I receive files like this regularly (podcasts). * First, why not let the RG scanning report errors? It has to decode through the entire file anyway. (I consider verification a core functionality, though I know foo_verifier is an external component.) Often I want to do both. * Aborting tag write while a (big) tempfile is written does take a helluvalotoftime, that cannot be necessary? Case in point: I encapsulate music video in fb2k-readable format (mkv or mp4), in order to play the file as audio. Biggg file then. Suppose I want to verify integrity, scan and tag ReplayGain, and do some other tag fixes - that could take ages due to file size, and the fact that fb2k requires multiple reads/writes. * The presentation of foo_verifier output could be better. Now, the Status column is too narrow to tell whether there is more than one error, and the Warnings too narrow to tell how inaccurate timing is. (I would have wanted fb2k to distinguish between "Reported length is inaccurate" and "Reported length is very wrong" too ...). 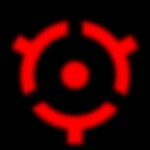 And, I cannot sort by Status or Warning or crop down to troublemakers - though I can if I write a report, luckily. * If I try to change tags in a number of write-protected files, it gives me error messages for all files selected, even for those that have no changes and should not be overwritten, true? * By the way: Setting file permissions to Read Only only prevents fb2k from changing file content, not from moving or deleting it ... is there a way to flag files as "do not (re)move this"? - When picking artwork for multiselection in mixed directories, set the starting folder to folder of first item. This is already possible. Go to Preferences -> Advanced -> Display -> Properties Window. You can disable current defaults, add own tags with own names, change order, etc. ^ Yeah, that works, thanks. Only possibly problem could be that it also affects the general tags and properties window. But in my situation I just wanted to disable comment tag to be displayed in selection properties so I deleted comment tag from there. (for correct display contents of Title/Artist fields when playback URL radio). * A "Repository for uninstalled components" folder, and so that the Install button defaults to opening that folder. Suggestion: append version to filename, and touch the "last modified" timestamp to uninstall time. And, I guess is only healthy to get rid of unneeded components from time to time, and then the user can be less cautious about what to uninstall. In both cases, letting the file explorer sort by uninstall time (= modification time) makes everything easier, I guess. * And with a folder for "previous versions". Any subfolder organization can be done by the user in the file explorer, and the user can also delete - no reason for fb2k to keep a database. In RIP dialoge a button for select all / deselect all tracks like in EAC.!!!! Just a small change: In Spectrogram Visualization allow more FFT Size settings, at least 32768 and 65536. 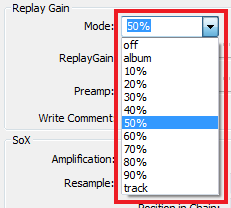 Given a Replay Gain tagged file, at playback time there's usually the choice between applying the album gain or the track gain. Both have their pros and cons but in general neither strategy seems to be perfect. If we consider album gain as the "natural strategy" because it preserves the loudness difference between an album's individual tracks we may consider track gain as some kind of "deviation" from the "natural strategy" aiming to correct some flaws of the "natural strategy". What do you think about it? Do you find it useful? I think it's a good idea, thought I think there are too many choices. 25%, 50% and 75% should be adequate, 20% steps will definitely be adequate. mi-i-i-inor nuissance. Either resizable - or just one character wider, and that slider will be gone. We would like to save and load the Extended M3U playlists with saving #EXTINF content (including a name of net radio or streaming video channel). Two additional context menu commands in tagging segment: "Copy tags" and "Paste tags". It will ease and speed up transferring tags between groups of files. Now that after decades Microsoft finally got around making explorer dark, maybe, just maybe, we could have it transplanted into foobar's UI instead of the ugly 90s white+grey?